Crisp on the outside, soft and chewy on the inside... 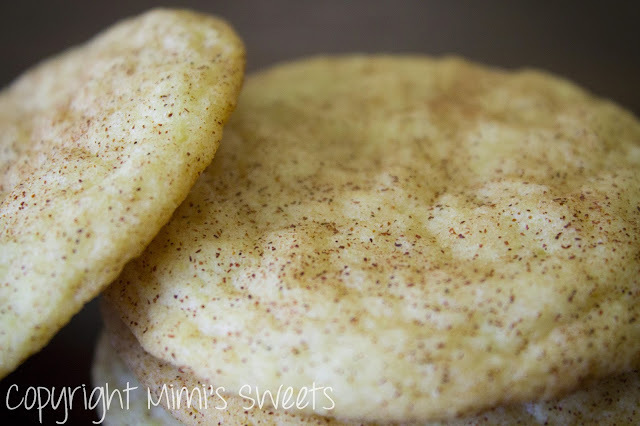 These snickerdoodles are perfection! I'm so excited to be sharing a newly offered cookie that you can order! I've been backed up on posting these for a little over a week because of all the other posts that I needed to catch up on. I could barely make myself wait to post these because of my excitement about how delicious these are, and the fact that cookies are my favorite to bake! My husband came to me and told me that I should bake something. When I looked at him like "and what do you want me to bake? ", he said: "Why don't you make snickerdoodles?". Uhhh... Snickerdoodles? I'm a little embarrassed to say that I had neither tasted nor made Snickerdoodles before. If you haven't read any of my earlier posts, I have severe tree nut allergies (among multiple other things) and there are very few brands that don't have the allergy warning on the back of the package stating that it was processed with tree nuts. While there may not be any nuts in them, I am very wary to try any of these because if there's even a trace of one of those nut oils, I'll have an allergic reaction. As most of you would probably agree, breathing is much nicer than having one of those cookies, or any other food that has that label on it. So, basically, I blame my never having had a snickerdoodle on that. I wasn't completely oblivious to what one was, though. I was fully aware that it is a variation of the sugar cookie. I just didn't know how closely they're related. I figured that making snickerdoodles was a good way to challenge myself and make myself a better baker. 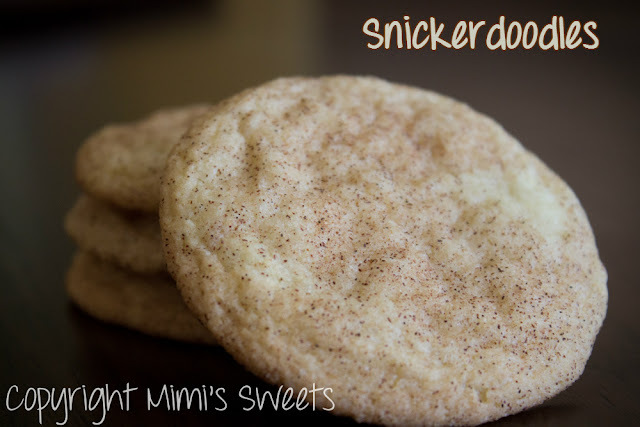 So, I decided to investigate to see how close my sugar cookie recipe was to a snickerdoodle recipe. The first and last website I pulled up was food.com. It gave me just enough information so I knew what a snickerdoodle was. Then I used my own recipe. I was a little unsure of how they would turn out at first, but after having my husband taste them after they came out of the oven, my fears disappeared. And as you can tell from the pictures, they turned out perfectly! They had that nice crisp on the outside, but were soft and chewy on the inside, and had excellent cinnamon sugar combination on the outside... just like they're supposed to. I have to warn you... They're extremely addicting, and you won't be able to eat just one! If you would like to place an order, you can do so here, or by emailing me at mandy@mimissweets.net. 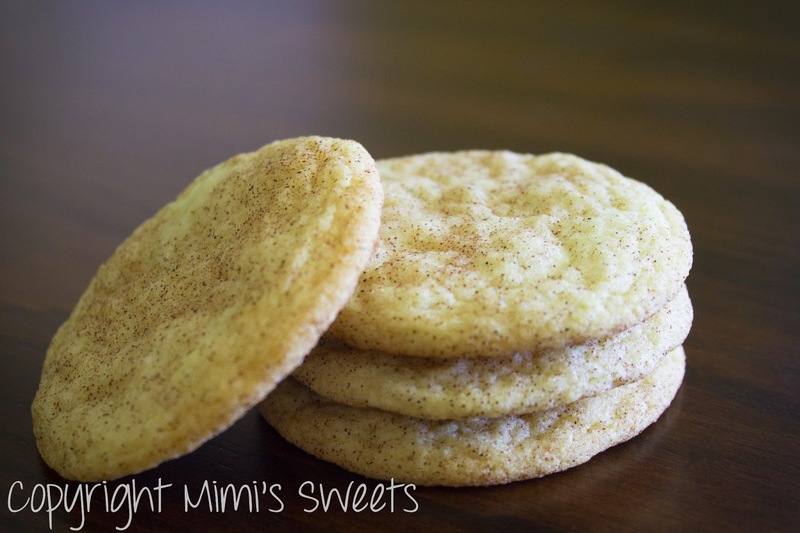 If you enjoy snickerdoodles or sugar cookies, check out my Sour Cream Sugar Cookies as well. Thanks for stopping by!